Those might be my favorite words in the English language. I’ve been a die-hard Mets fan since 1986, when my father introduced me to baseball at the age of 6. I don’t remember much of that magical season, though I do remember dad being very happy! 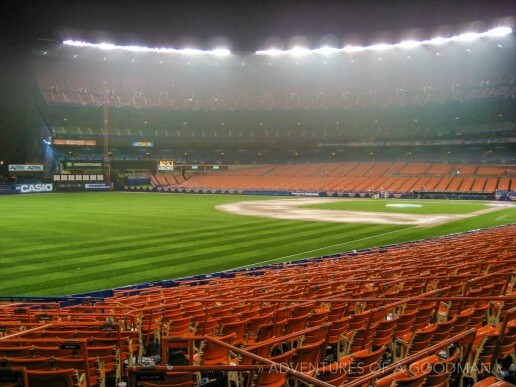 Over the next 22 years, I attended of games at Shea Stadium. 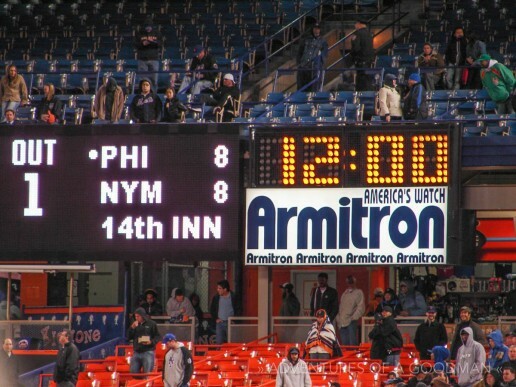 For a while, my dad joked that the Mets should hire me as their good luck charm … because I so rarely saw the Mets lose. Now, although Shea Stadium and my father have both gone, I am left with a lifetime of photographs and memories of both. 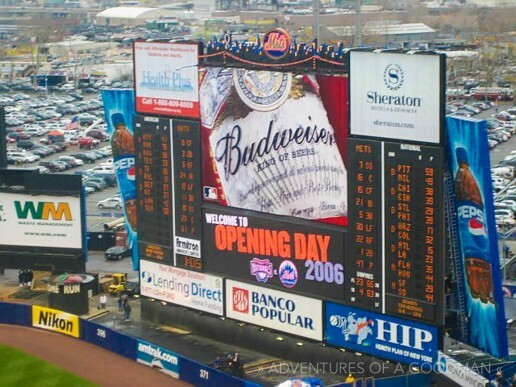 The majority of the Shea Stadium photos on this page were taken during the 2006, 2007 and 2008 seasons. Enjoy, and LETS GO METS! Located in Flushing Meadows, Queens, Shea Stadium was home to the New York Mets for 44 years, from 1964-2008. At it’s peak, the ballpark could hold 57,333 fans … though many more crammed in for concerts and special events. Often known as a pitchers park, centerfield was a whopping 410 feet away from home. This didn’t stop sluggers like Mike Piazza from clobbering the ball right over that blue padded wall. 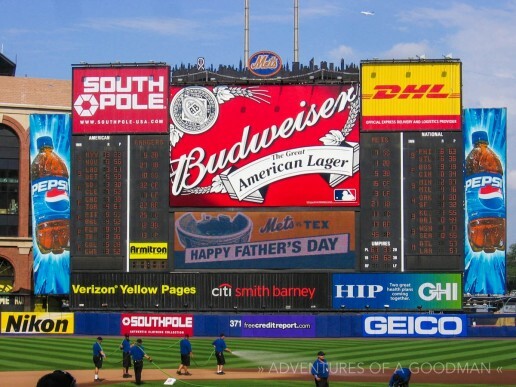 In addition to being home to the New York Mets, Shea Stadium also hosted several other NY sports teams. From 1964 – 1983, Shea Stadium was home to the New York Jets football team. Meanwhile, the New York “Football” Giants played their 1975 season at Shea. The New York Yankees played their home games at Shea in 1974 and 1975 while Yankee Stadium was being renovated. 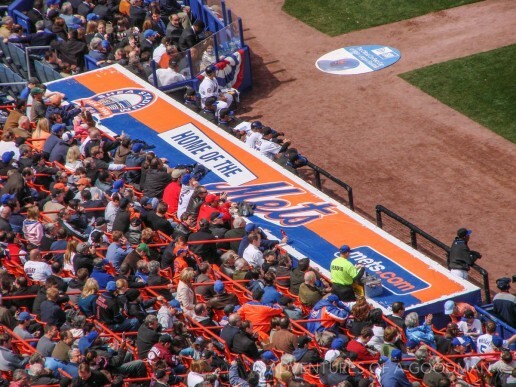 Plus, the Yankees also had home field advantage for one memorable game in 1998, when Darryl Strawberry famously hit a home run for the Yanks and the Shea Stadium Apple rose halfway … stopping just before the Mets logo showed. My friend Mario and I used to call it “Mecca.” The holiest place on earth for New York Mets fans. 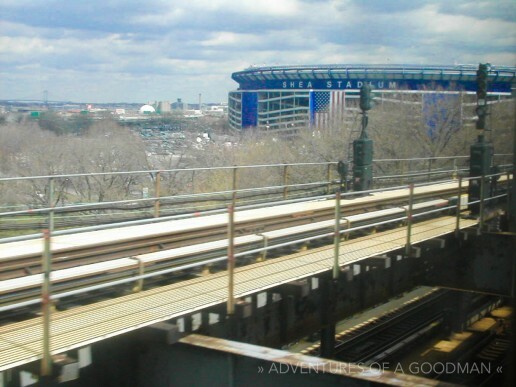 I still remember the joy I felt every time the 7 train approached the Willets Point – Shea Stadium subway stop. Looking out the left side window, you could start to see the ballpark about 30 seconds before arriving at the station. Sure, the view was obstructed by trees and the Manhattan-bound track … but it didn’t matter. Shea was near, and a ballgame was soon to follow! After getting off the train, there was that long platform that circled down into the turnstile area. It was always packed with people, and had several little souvenir stands in case you needed something else with a Mets logo. Security was basically non-existent back then. The guards would barely check your bag, and pat-downs were not required. On the way back down, the ramps were by far the best way to go. After a Mets win, and especially during important games or the postseason, you could cheer the entire way down … and all the way back to the subway … and all the way to your subway stop. Say it with me… LETS … GO … METS!!! Swipe and Move! Just swipe and move people. It's not rocket science! As a die-hard fan, I could write volumes about all of my fond memories of Shea. I loved the way the upper decks shook whenever something awesome happened. I loved how the Apple came out every time a Met hit a dinger. I loved how you could sneak down to field level by climbing over the wall separating it from the loge level. I loved watching the teeny tube TVs above the food stalls while I waited for a hot dog. From the highs to the lows, it was my second home for much of my life and it’s demise in 2008 finally inspired me to get a dslr and properly document the place while I still could. It also led to my Baseball Stadium Photo Tour photographic series. Sure it wasn’t perfect. The concourse was narrow, cold, gray and separated from the game. That may be, but it also was the best place to watch nine innings with 55,000+ cheering friends. I Don’t Wanna Shea Goodbye! I was there for the last baseball game at Shea Stadium. We shoulda won it. We should won it all! But alas, on September 28, 2008, we all had to Shea Goodbye! They call it Citi Field ... but I'm calling it Shea!